Despite the fact that Congress largely rejected the Administration’s proposed cuts to foreign assistance back in March, the Executive Branch is trying a new tactic to specifically target the life-saving work being done by the State Department and USAID around the world. This tactic is called a rescission package, and it’s pretty complicated. Basically, a rescission is the cancellation of budget authority previously provided by Congress. In this case, Office of Management and Budget (OMB) Director Mick Mulvaney is announcing a package that will specifically focus on cutting development and diplomacy. The Impoundment Control Act of 1974 says that the president can propose to Congress that funds be rescinded. The Act also says that once the Administration formally submits a rescissions proposal to Congress, any funds up for rescission are frozen for 45 days while Congress considers the proposal. That’s especially bad right now because Congress is on recess until September. When they return, there are only 11 legislative days before the end of the fiscal year, and they have a LOT to do, including managing the Supreme Court nomination. They may not get a chance to approve or reject the rescissions package by the end of the fiscal year. So the funds could wind up expiring and being returned to the Treasury. Like we said, it’s very complicated. But here’s how that will affect children and families living in extreme poverty. These cuts target money that was planned to be provided to life-saving programs as grants in 2017 and 2018. If the money is frozen now, those programs will not begin. Organizations, like World Vision, who applied for the funds, planned new programs, and talked to local community leaders, will have done all of that work in vain. And when lives are on the line, every day counts. Children in extreme poverty shouldn’t suffer because of political plays. Because of your quick response to this need and the quick response of hundreds of other people across the country, as of Tuesday, August 28, 2018, the Administration withdrew the rescissions package and will not be sending it to Congress! THANK YOU for wanting to use your voice to make sure that Congress knew this was important to you. 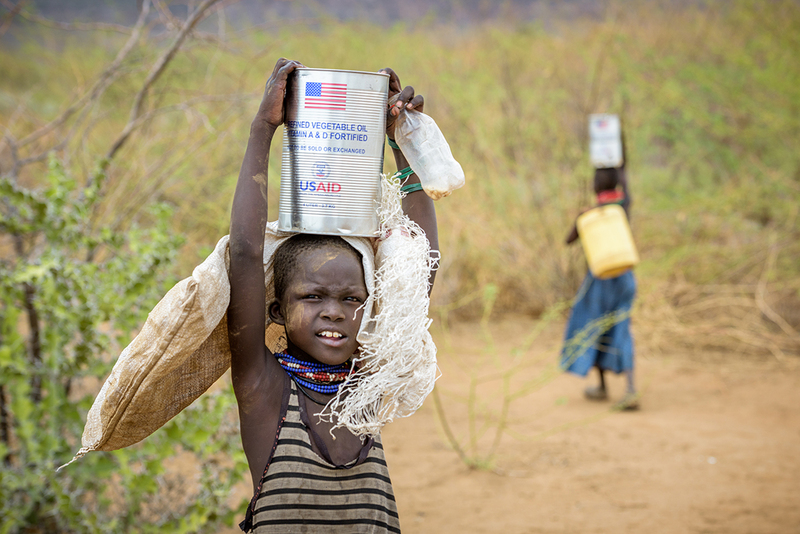 If you have a minute, please use the form at the bottom of this link to thank your member of Congress for prioritizing children and families in extreme poverty around the world. Photo: Families leave World Vision food distribution with bags of maize and cans of cooking oil provided by USAID in Turkana, Kenya. ©2017 World Vision, Jon Warren. ← Join a community of ordinary people following God’s call to seek justice! we have been blessed to be a blessing to others. Thats what God’s Word tells us and one of the principles this great nation was founded on. Lets not change that now! The USA is much better off when we support those in deep need as much as possible. Please don’t cut funding for Development and Diplomacy. Never before in the history of our nation have we seen such hatred, racism, bigotry and intolerance as that currently being displayed, supported and condoned by the Trump administration and the Republican white supremacists, haters, racists and bigots in Congress and in our state legislatures. We are all connected in this universe, No matter the color we are all human beings.Therefore we are all worthy of respect and compassion. Let Us rise to our highest level of humanity ! Thank you for keeping us informed. We are ready to act. This is very important. Please don’t let money that was already approved for spending for internationally poor countries be put on hold. World Vision has great programs that are saving lives. They are committed to helping people, shouldn’t we as a nation keep our commitments? The money is already earmarked for projects, let’s not debate about it while people are dying without our help. God has blessed this Nation so we could bless others. I have lived and traveled in many countries in Africa, and have seen the extreme poverty and sickness. Our aid and development projects are so needed to help these suffering families. Thank you for not allowing the rescissions package to delay or stop development and diplomacy. Development and Diplomacy. A good move, a humane move. Keep it coming. Thank you.